Posted in Life on the Road with Lama Zopa Rinpoche. Every day during the Hayagriva retreat, Rinpoche has been offering a party to the monkeys. Rinpoche has provided the monkeys with a very nice setup. Three big basins serve as their baths and swimming pools. They’ve been given lots of different colored plastic balls that they can throw around and play with. Also, there are lots of plastic bottles filled with water – perfect for playing with and punching. Rinpoche throws food out to them daily: chocolate, fruit, biscuits, bread, puffed rice – everything that is edible in the house. Today was unusual because it seemed that there was an abnormal amount of teenage monkeys and they were extremely wild. They were bouncing off the roof, hitting windows, going from tree to tree, bumping into each other and jumping into the water basins for almost three hours. It was a completely wild scene! The other day, one monkey stole Rinpoche’s underskirt that was hanging outside on the roof to dry. The monkey managed to wrap Rinpcohe’s underskirt around him, like a cape, and eventually over his head, causing him to freak out and fall out of the tree. When that happened, he went wild and ripped it in half. It now hangs in two pieces up in a tree. Welcome to this special new feature of the Mandala website, our first blog: Life on the Road with Lama Zopa Rinpoche. FPMT’s CEO, Ven. Roger Kunsang, is on the road with Lama Zopa Rinpoche most of the year serving as Rinpoche’s tireless attendant, a post he’s kept since 1986. We at FPMT International Office keep up daily with Ven. Roger through email, Skype and phone. We are fortunate to receive many inspiring stories, updates and anecdotes from Ven. Roger as he accompanies Rinpoche around the world. Further, anyone fortunate enough to attend to Lama Zopa Rinpoche invariably emerges with amazing stories of a true bodhisattva in action. And now, through this blog, we’ll be able to share these communications with you. As Ven. Roger’s schedule and time are unpredictable, we can’t promise he’ll be posting regularly. But we can promise, when he does, you’ll be afforded a rare glimpse into the FPMT organization, as well as the daily life of our precious spiritual director, Lama Zopa Rinpoche. When Ven. Roger isn’t available, we’ll post stories from Rinpoche’s other attendants as well as little gems from Rinpoche’s house in California. One of Lama Zopa Rinpoche’s Vast Visions for FPMT is for FPMT centers to display large thangkas and host festival days where these thangkas can be enjoyed. Large thangka of Guru Rinpoche. The thangka will be displayed during 1,000 Padmasambhava tsog offerings in India and Nepal and during special occasions. Photo by by Ven. Thubten Kunsang. Thangkas are painted or appliquéd depictions of deities, venerated spiritual figures, or common religious symbols, usually framed by colorful brocade. 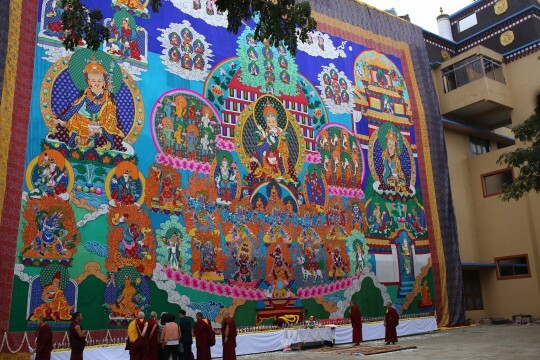 In 2011-2014 Lama Zopa Rinpoche, through the Lama Zopa Rinpoche Bodhichitta Fund, commissioned a 55 ft x 40 ft high stitched appliquéd thangka of Guru Rinpoche (Padmasambhava). More info on this project…. Chenrezig Institute, Australia, large 1,000-Arm Chenrezig thangka is displayed at the Festival of Tibet each year and seen by over 5,000 people and is the backdrop to political discussions, meditations, concerts, and dharma talks. Istituto Lama Tzong Khapa, Italy, has a large Maitreya thangka which they show during Buddha multiplying days (weather permitting) and during any great occasions at the center. Medicine Buddha Festival Day with large thangka (24 ft), Land of Medicine Buddha, CA, USA. Painted by Peter Iseli. Ksitigarbha Festival Day with large thangka (9.5 ft), Land of Medicine Buddha, CA, USA. Vajrasattva and consort thangka (11.5 ft), Land of Medicine Buddha, CA, USA. Painted by Peter Iseli. Pamtingpa Center, Washington, USA, has a large Tara thangka to which they offer 21 Tara dance. Losang Dragpa Centre (LDC), Malaysia. LDC unveiled a large Medicine Buddha thangka as part of their 1,000 Offerings Event, with Khenrinpoche Geshe Chonyi presiding. This thangka will be featured in an annual festival and offerings event. 21 Tara thangka at Institute Vajrayogini, France, 14 meters (46 ft) high and 9 meters (30 feet) wide. 35 Buddha thangka, Kopan Monastery, Nepal painted by Peter Iseli. Several smaller copies of Peter’s are also used for display at Kopan. Amitabha Buddha in his pure land accompanied by the eight great bodhisattvas (50 feet x 31 feet), sewn entirely by hand by Tibetan artists in south India. Amitabha Buddhist Centre, Singapore. 21 Tara thangka, Tara Institute, Melbourne, Australia. Painted by Peter Iseli. Please enjoy a photo gallery of many of these large thangkas being created around the world. Having a workshop to create huge thangkas has long been one of Lama Zopa Rinpoche’s wishes. After many years of planning and discussions with Swiss artist Peter Iseli, this project has become a reality at Institut Vajra Yogini in France. The workshop is 8.5 meters (28 feet) tall. Rinpoche’s first order was a 21 Tara thangka that is 14 meters (46 feet) high and 9 meters (30 feet) wide. Peter Iseli working on a large 21 Tara thangka in the workshop that Lama Zopa Rinpoche had built for large thangka painting in France. Peter Iseli, master thangka painter, has made huge contributions to Lama Zopa Rinpoche’s vast vision. Peter Iseli is responsible for painting many of the large thangkas listed above. The thangkas themselves are massive, matched only by Peter’s generosity – he offered to paint these for free! The Lama Zopa Rinpoche Bodhichitta Fund supports the creation of large thangkas around the world. If you would like to contribute to Rinpoche’s Vast Vision you may contribute any amount to this fund.